Born: 18 June 1893, Basel, Switzerland. 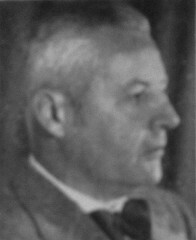 Markus Zschokke studied at the Universities of Basle and Zuerich and qualified as a veterinarian by passing the Swiss Staats Examen in 1917. The next year he obtained the degree Doctor Medicae Veterinariae (Dr Med Vet) at the University of Zuerich with a thesis on teat development in cattle: Die entwicklung des ausfuehrungsgangsystems der milchdr?se... (Bonn, 1919). He was one of three Swiss veterinarians recruited by Arnold Theiler* in 1919 to join his staff at the Onderstepoort Veterinary Research Laboratory where he was appointed as bacteriologist in February 1920. He left Onderstepoort in 1922 to go farming in Limpopo Province and in 1926 was listed as residing in Musina. In March 1927 he moved to South West Africa (now Namibia) as State Veterinarian and served in this capacity until his retirement in 1953. In 1931 Zschokke collected ten phyllopods (an order of the crustaceans) at Omaruru. Using Mrs Margaret Sordahl* (who had stayed at the Mount Brukkaros Solar Observatory until December 1931) as a go-between, he presented these specimens to the United States National Museum in 1933. In 1934 he published a paper on milk fever in sheep in the Journal of the South African Veterinary Medical Association, followed by another in the same journal on tattooing as a means of marking stock (1939). After his retirement Zschokke stayed in service as temporary State Veterinarian specially devoted to the eradication of lungsickness in cattle and rabies in the northern regions of the territory. He finally retired in 1965. For the last 23 years he was stationed in Grootfontein, where he is also buried. Zschokke had wide interests, also in cultural affairs. He was the local representative of the South West Africa Scientific Society in Grootfontein, and a member of the Commission for the Preservation of Natural and Historical Monuments, Relics and Antiques. As such he played a leading role in the proclamation of Fort Namutoni in the Etosha Game Park as a national monument. As recreational activities he listed the study of nature, game preservation and hunting. Plug, C. History of the Solar Radiation Expedition to Mount Brukkaros, South West Africa, 1926-1931. South African Journal of Science, 1989, Vol. 85, pp. 174-180. United Transvaal Directory(Messina), 1926, 1927. Johannesburg: United Transvaal Directory Co.
Zschokke, Markus: Obituary. Journal of the South African Veterinary Medical Association, 1972, Vol. 43, p. 412.
Who's who in southern Africa, 1961.